Summer spinning reel has a lighter and stronger CNC machined aluminum spool that has more even line lay, internal grooves for lube retention, and more fishing line capacity. Summer 5000 Weight(g/oz) 13.6oz/387g / Max Drag LB/KG 20LB/ 9KG / Gear Ratio 5.2:1/ Line Capacity (mm/m) 0.40mm/150m, 0.50/100 / Monofilament Capacity (lbs/yds)12Lb/330 Yds, 16/245GREAT VALUE – Loaded with features yet low on price. KastKing Summer offers the best value…at any level. 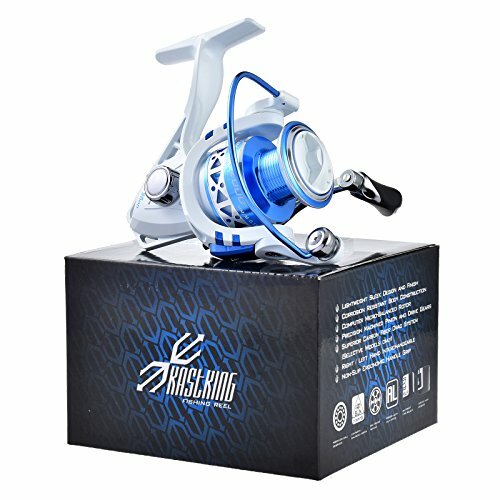 The KastKing Summer Fishing Reel turns any angler into a PRO.